If you were having a great time watching the comedy movies of Rowan Atkinson called Johnny English, well then, you will surely be entertained once again because he is back for the third time around. 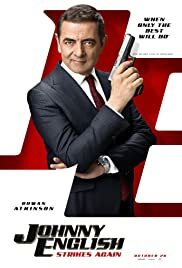 There are plenty of posters circulating right now in the social media of Johnny English 3 and yes, it is true that our favorite clumsy spy will be back on theaters this year and do his assignment one again all over Europe to reveal an evil plot that would bring disaster to the whole region of Britain and even to the whole world. The movie begins in Britain which is facing cyber-attack and with that attack it exposes names of undercover agents who are deployed in the field. And once more, the agency calls on Johnny English who is currently working as a teacher in order to stop the hacker who is responsible for the cyber attack and put the man behind bars. Furthermore, we will be seeing stars in the movie such as Jake Lacy, Ben Miller, Emma Thompson and David Kerr who is the director of the movie. If you don’t know about Johnny English, this is all about a movie that tries to spoofs a popular British spy movie character James Bond. We all know Rowan Atkinson is a good comedian and we definitely want to enjoy more of his movie.